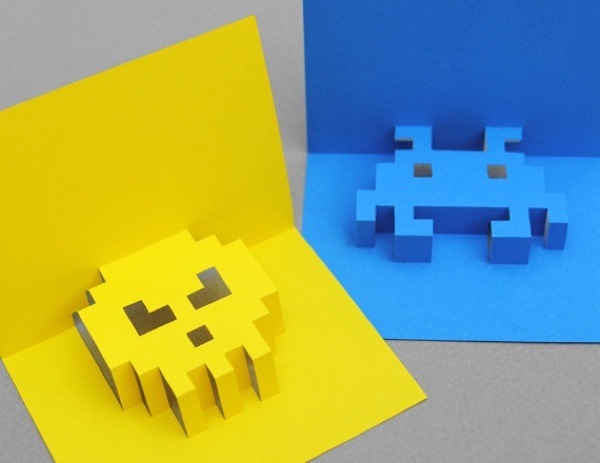 Have you ever wanted to make a simple, but cool 8-bit card, but didn’t know how? Well with this tutorial, you can learn. It looks super simple, and as long as you have a steady hand and can follow a pattern, you can make these neat cards for someone close to you. There’s currently a Space Invaders pattern, and a Skull pattern available, but I think with a bit of effort, it wouldn’t be to difficult to make this type of card for just about any 8-Bit pattern you can think of. If you’re looking for the perfect font to print onto your card, which I advise you do before you cut it out, there are several bitmap fonts available at dafont.com.